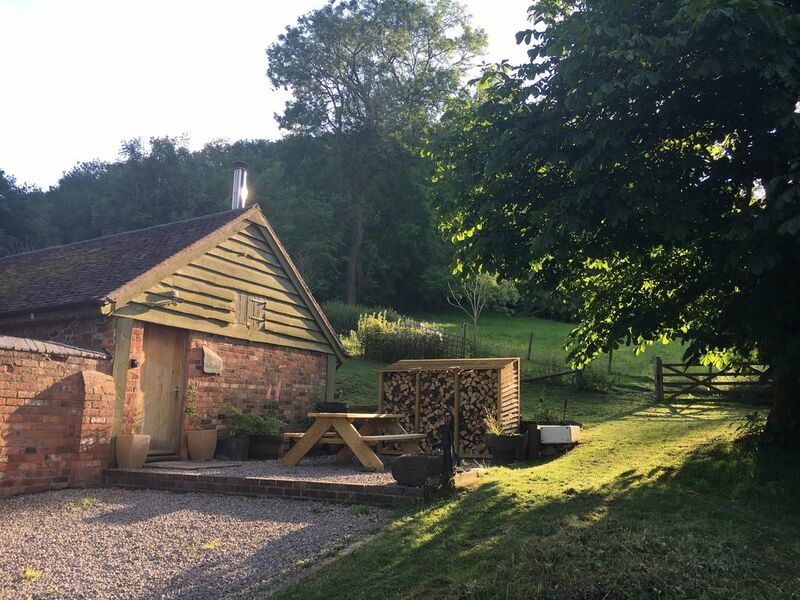 The Outhouse is a beautifully appointed, self-contained out-building. It includes a large bedroom, high quality bathroom with bath and shower, large living area/lounge with integral fully-equipped kitchen and parking for 2 cars or more. There is an outside sitting area to relax and enjoy the views both over to Cheltenham, as well as up towards the woods of Gloucestershire Wildlife Trust's Chosen Hill nature reserve. It’s an ideal alternative to a hotel. We are a family of 4 with 2 young children (as well as a spaniel called Roxy, chickens, bantams, 2 goats and 2 sheep!). The opportunity to rent out accommodation became increasingly apparent as "The Outhouse" was in limited use other than by family on visits. We took about the task of upgrading it to be as special as possible. The infrastructure, both internally and externally, was almost perfect already - we just needed to invest in furnishings, which we haven't held back on. Given a chance we chill out in there when we can. We book it out for ourselves too! It's very close to both Gloucester and Cheltenham but in a rural setting. The tree-lined drive - as you approach it - puts you in the right frame of mind after either a social or business trip. Amazing wildlife (green woodpeckers for example) is abundant. It's the perfect place to relax with many rural attractions, but close to city life. Lounge with flat screen TV, satellite and Bluetooth Hi-Fi with connectivity for smart phones. Free wi fi. Large kingsize sofa bed. Dining area for 4. Modern, contemporary furniture. Speaker system that can be paired with a guests' Bluetooth device e.g to enable music on a iPhone to be played through the speaker system into the property. Access to outdoor seating area. Not enclosed. Property on one level so suitable for wheelchair access, though outside there is a gravel drive. Outside: Private outside seating area with lovely views over to Cheltenham. We had such a lovely few days staying in The Outhouse! Great base for exploring The Cotswolds, nice local pub and a good selection of places to eat within walking distance. Sarah and Andy gave us such a warm welcome. We only wish we could have stayed longer! Had a great time in this beautiful location, we were made so welcome by the owners and the accommodation is so comfortable with everything you could possibly need. This is a great base to explore the area and the views are just spectacular, thoroughly recommended. Light and airy very well-equipped. Friendly owners who made you feel very welcome immediately. The property was a lovely barn conversion with modern, stylish interior with high ceilings. Impeccably clean, deceptively spacious and open plan. Woke up at 6.00am and watched the sun come up to the accompaniment of nothing but bird song. We only stayed the one night but immediately decided to book a week in May. Our 2 dogs were free to roam as the property is set well back from the main road. The owners' family were very keen to help us settle in and shared lots of useful information about the area. We reluctantly drove away feeling like we had made some new friends. Great having you staying again! See you next year! We found the outhouse without any problems. It's beautifully located & provided all the amenities we needed. Andy & Sarah were very helpfully. We will certainly be coming back & will be recommending it. Thanks for the kind review - look forward to seeing you again! Please contact Owner on 07710 515554 if any questions. Thanks!